What is matcha green tea? What are the different types and grades? How about green tea powder? Buying tips. Matcha is a high-quality green tea powder. Traditionally, it is used for chanoyu, the Japanese tea ceremony. The best matcha comes from the Uji, Aichi, Shizuoka and Kyushu regions of Japan. In the Japanese Tea article, we go through the differences between gyokuro, tencha and matcha. To recap: for a high quality matcha, they all come from the same tea plant. The young tender tea buds are used to make gyokuro; the larger leaves are used to make tencha, which is then stoneground to make matcha powder. Want to buy a green tea powder? It is important to understand there are different grades available for different usage. Ceremonial grade is the highest grade. It is hard to find outside Japan. It is used by the major tea schools and Buddhist temples in Japan specifically for the tea ceremony, where it is blended to be served straight. Premium grade is more of an everyday beverage. It is still very good and much easier to find. The grading system above is purely conceptual. In reality, there is no governing body to regulate the labeling of matcha products. Different companies can call matcha whatever they want! In the West, you will find many companies labeling their products as Ceremonial grade when in reality they are Premium grade. Ingredient grade is cheaper and is added as an ingredient to foods and beverages such as smoothies, protein shake, latte, cakes, iced cream, chocolate and cupcake! This grade of matcha needs a stronger flavor to compete with the other flavors in foods and beverages. It is mixed with older tea leaves, which have stronger flavors. Lower grade matcha would be known simply as green tea powder. What are the differences between a high quality matcha and a low quality green tea powder? A high quality matcha has a vivid green color, subtle sweetness and grassy aroma. It is smooth with a hint of astringency. On the other hand, a low quality powder will taste more flat and abrasive. There are a number of reasons why this is the case. For matcha, tea plants are grown in shaded conditions before harvesting takes place. This slows down growth and encourages the tea buds to produce more theanine. Matcha is made from younger tea buds that are harvested earlier in the season. Stems are veins are removed. These higher quality leaves are more tender and soluble. They contain more theanine and antioxidants. Lower quality powder is made from mature leaves that are more fibrous. Stems and veins are retained. Matcha is ground into fine powder using slow-turning granite grinding wheels. Friction is minimized and tea leaves are not “burned” in the process, allowing the leaves to retain chlorophyll. Matcha is sourced from Japan. The seller needs to show that the tea hasn't been polluted by radiation. Lower quality is sourced from China. The seller should be able to demonstrate the product is safe from pesticides and heavymetals. From the above, we can deduce the following guidelines when you are buying a matcha powder. First, make sure the tea was grown and processed in Japan. Other countries simply don’t have the right environment to make a high-quality product. Secondly, look at the color. The greener the tea is, the higher the quality. Third, look for powder that has been stoneground. Powder produced by other methods loses a lot of antioxidants. Fourth, try to determine what part of the tea plant was used. It should be made from the top 3 leaves and the bud only. Some companies will mix in stems and bigger leaves, and this makes it taste harsher than it should. Click to read our product review. 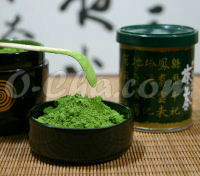 In addition to the different grades, there are also two types of matcha: koicha (thick tea) and usucha (thin tea). Koicha has a mellower, sweeter flavor and is mixed with relatively little water to form a thick emerald brew. It is used exclusively for Japanese tea ceremonies. Usucha is less sweet, and is whisked vigorously with more water to create a thinner, frothier tea. When brewing a cup of matcha, you have to remember that a matcha is simply tiny bits of powdered leaves, it doesn't truly dissolve in liquid. It is more like a 'suspension' in the water. Even when whisked up as much as possible and it looks like a green liquid - there's still tiny bits of green plant material that you don't notice. Over time they can start to settle at the bottom of your cup. Traditionally in a Japanese tea ceremony you whisk your matcha in a bowl with a bamboo whisk until there is froth - and then you drink the whole bowl rather quickly! When at home, you probably want to drink it more slowly like a normal glass of tea. You can add it to matcha smoothie or give it s whisk to mix it up. You can also use a shaker bottle. Try drinking it in 3-4 big gulps like the traditional way or just keep mixing it once you notice any sediment. Popular wisdom holds that by consuming green tea whole, you get more of the antioxidants than you do in regular green tea. To prove their points, matcha sellers often cite a 2003 study conducted by University of Colorado, which found that it contained 137 times as many antioxidants as a popular green tea beverage. The same study also found that it contains antioxidants at least three times the rate of the largest literature value for other green teas. So, is drinking matcha healthier than drinking green tea? Or is the truth more complex than what the matcha sellers make or out to be? What's the hidden meaning and history behind the traditional ritual of tea ceremony? What the fascinating history behind Japanese tea bowls reveals about buying a chawan for making Matcha tea.